Trying to make it in this world you do have to be tough, especially if you’re an artist trying to make it. There are so many others out there vying for everybody’s attention that you do have to be tough to accept anonymity but also resourceful and creative to separate yourself and make your voice heard. If you’re neither tough nor creative, then you end up a grumpy old man who gets angry every time he listens to the radio. 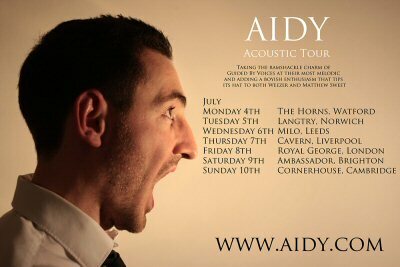 Singer songwriter Aidy had a busy 2010. After moving to Cambridge and releasing a few albums that remained frustratingly under the radar, he decided to do something different. "I set myself the challenge last year of writing, recording and releasing one new song every week for the entirety of 2010." That’s a New Years’ Resolution I haven’t heard before. Unlike most people, Aidy stuck to it, which resulted in 53 new songs added to his repertoire, a record deal with Expat Records and a couple of festival appearances, including Green Man Festival." Just to recap in case you've just come along to my site for the first time ever. On Friday 1st January 2010 I decided to take on the challenge of writing, recording and releasing one new song every single Friday the entire year, which I thought would be a grand total of 52 songs. Turns out there are actually 53 Friday's in 2010, I didn't know that until a few weeks ago! Anyway, it's finally come to an end and after a years worth of recording, writing, mixing, mastering, snapping guitar strings, breaking mic stands and not sleeping I released the 53rd song of the project this evening entitled 'Cradle To Grave'. I'm actually pretty tired now, and I'm off to bed, when I'm feeling a slightly more alert I'll come back with some reflection and highlights of the year and the project! Happy Xmas, Happy New Year, and have a great 2011! Thanks to everyone who's helped me, put me on a stage, played with me, shared me, streamed me, liked me, re-tweeted me, collaborated, been in videos and everything between!